All La Roche are delivered fully tested, complete and ready to work. In our Bar Bending Machines we provide a full tool set, enabling the operator to bend each diameter of bar correctly with the correct radius to BS Specifications. So if the Bar Bending Machine is purchased to bend 6, 8, 10, 12, 16, 20, 25 and 32mm bar the La Roche Machine will have all of the tool set included to bend these diameters correctly. T Range Bar Bending Machines are used all over the world in the most varying of conditions, they have time proven reliability, we have machines working on sites and in factories which are over 30 years old. La Roche Machines are very safe, we pride ourselves on the safety we have built into our machines. Our electrical panels are built in house and therefore we know what goes into our machines. All of the machines we make are CE regardless of the machines final destination, therefore all of the quality, safety we put into a machine that may be sold in Europe will also be in a machine sold in Africa or the Middle East. 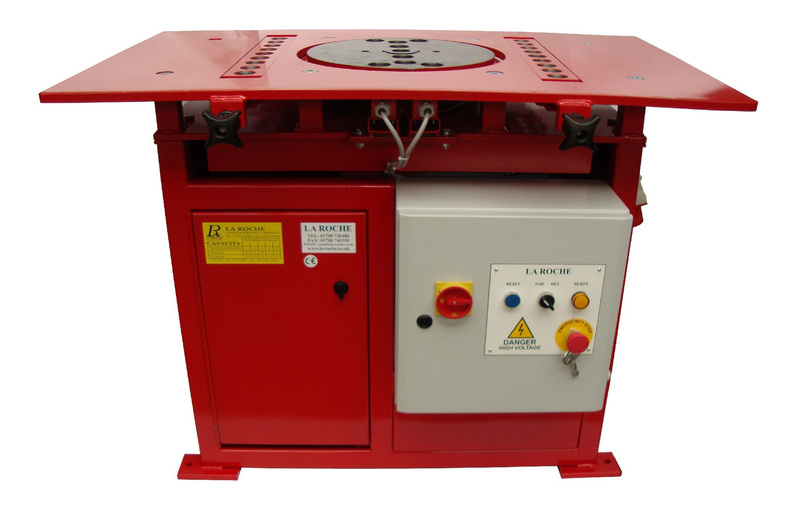 For example our Bar Bending Machines the operator can stop the machine at any stage in the bending process via the foot pedal, this passes the control of the machine to the operator, our control voltage is 24v for safety. La Roche Bending Machines bend bar at the most suitable speed for the largest Diameter bar. You will find La Roche Bar Bending Machine are sometimes up to 50% faster than other Bar Bending Machines on the market. The LRB40T Bar Bending Machine bends bar at 11 rpm and other Bar Bending Machines from other manufactures bend at 6 rpm, this proves the La Roche Bar Bending Machine will achieve higher productivity. La Roche Machines are made to bend reinforcement steel of 85kg/mm2, other machines on the market quote 65kg/mm2 or 70kg/mm2 or 80kg/mm2. This proves the strength of the La Roche Machines.